Early Future was the world's first OLED lighting product. It's a table lamp that has 10 OLED panels. The OLEDs are made by OSRAM, and the lamp was designed by lighting designer Ingo Maurer. The OLEDs achieve a luminance of 1,000 cd/m2, 2,000 hours of lifetime and an efficiency of 20 lm/W. 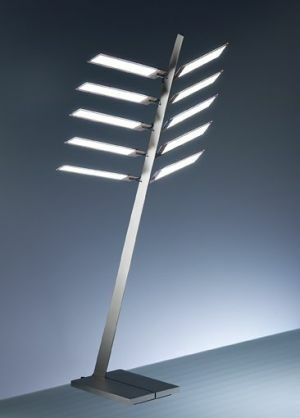 OSRAM offered this lamp back in April 2008, but they made only 25 units - and each went for about €25,000!